Don’t those three look smug, and pleased with themselves? 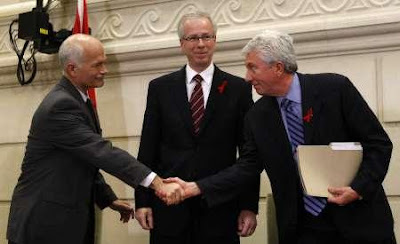 This picture is front and centre on newspapers Canada-wide under the huge header: “It’s a Done Deal.” Those three men, Jack Layton on the left, Stephan Dion in the middle, and Gilles Duceppe are all leaders of the main political parties who have just signed an ‘agreement’ to form a coalition government in Canada. These are strange times in Canadian politics. Just six weeks ago, Canadians trudged to the polls for a federal election that nobody wanted; nobody, that is except the Prime Minister, Stephen Harper, who declared an election necessary because his minority government decided that parliament was unworkable. So off we all went to do our civic duty. Well, some of us did as we saw one of the lowest voter turnouts in history. The results of the millions of dollars spent saw Harper’s Conservative Party STILL in a minority position, albeit with more seats. To form a majority government (and then, in theory have free rein to run the country according to their own philosophy) Harper needed 155 seats. He got 143. Now those three gems pictured above have decided that THEY are more qualified to run this country. Did any of them win a mandate to do that? No, of course not. What has brought the country to this precipice is an overload of arrogance on the part of ALL party leaders…. There is more, here on NewsBlaze. Filed under: Canadian huh |	Comments Off on Canadian, huh?